Background — Mean platelet volume (MPV) is an indicator of platelet activation. The pathophysiology of the primary and secondary Raynaud’s Phenomenon (RP) have not been completely established. The aim of this study was to investigate the relationship between MPV and RP. Materials and Methods — Our study was a prospective randomized study carried out from January 2011 to March 2012. The study group consisted of 39 patients: 27 (70%) patients having primary, 12 (30%) patients having secondary RP. An age-, gender-, and body mass index-matched control group consisted of 40 healthy participants. We compared the MPV in patients with RP and control participants statistically. Results — MPV of RP group was 8.79±1.37 femtoliter (fL) while MPV of control group was 8.39±1.36 fL. 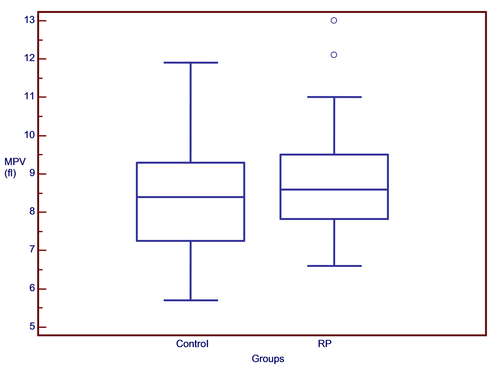 Comparison of MPV of RP group and control group showed no difference (p=0.274). The mean of MPV was significantly higher among patients with secondary RP (9.76±1.68 fl) when compared with patients with primary RP (8.37±0.96 fl) (p=0.018). Conclusion — The results of our study suggest that MPV may be used as a marker in secondary RP. Memetoğlu ME, Kutlu R, Memetoğlu OG, Kehlibar T, Yılmaz M, Günay R, Ketenci B, Güney MR, Demirtaş M. The evaluation of mean platelet volume levels in patients with primary and secondary Raynaud’s Phenomenon. Russian Open Medical Journal 2014; 3: 0101. Raynaud’s Phenomenon (RP) is typically manifested by an initial white discoloration (pallor) of the digits as a reaction to cold, which leads to cyanosis, pain, and numbness, followed by postischemic red flush upon rewarming [1, 2]. Differentiation between primary RP and secondary RP does not reflect a diagnosis in the strict sense, but rather a description of the current findings in an ongoing screening process. Classifying a patient as having primary RP means that, up to that point in time, no underlying disease has been identified. Secondary RP is frequently present in patients affected by connective tissue diseases (CTDs), including systemic sclerosis (SSc), systemic lupus erythematosus (SLE), Sjögren’s syndrome, dermatomyositis or polymyositis, and rheumatoid arthritis (RA) . Secondary RP is essential as a possible marker for other underlying diseases such as CTDs that may lead to morbidity and mortality. Recent advances in automated blood cell analyzers have made it possible to obtain new information about platelets through the measurement of platelet parameters. The most commonly available derived parameter is the mean platelet volume (MPV), calculated by dividing the plateletcrit (PCT) by the total number of platelets . Increased MPV may reflect either increased platelet activation or increased numbers of large, hyperaggregable platelets . Large platelets that contain more dense granules are metabolically and enzymatically more active than small platelets and have higher thrombotic potential. They express higher levels of prothrombotic substances, thromboxane A2, serotonin, b-thromboglobulin, and procoagulatory surface proteins, such as P-selectin and glycoprotein IIIa . To the best of our knowledge, the association between primary RP and secondary RP according to MPV has not previously been analyzed. The purpose of this study is to investigate whether MPV differs in patients with primary and secondary RP compared to control subjects. Data were collected prospectively from January 2011 to March 2012 in the physiotherapy-rehabilitation and cardiovascular surgery departments of our hospital. The study was carried out according to the principles of Declaration of Helsinki, and local ethical committee was approved the study. Thirty nine patients consisting of 24 females (62%) and 15 males (38%) who had had RP for 1 to 45 years were studied. The patients’ mean age was 38.64±16.7 years. Raynaud’s Phenomenon was diagnosed in the presence of episodic attacks of well-demarcated color changes (to white or blue) of the fingers on both hands on exposure to cold. Twelve patients were classified as having seconder RP because of having collagen vascular disease or connective tissue disease on the basis of positive antinuclear antibodies and laboratory results; abnormal physical examination and capillaroscopic findings including dilated and enlarged nailfold capillaries. Disease characteristics of patients with secondary RP are given in Table 1. An age-, gender-, and body mass index-matched control group participated in the study consisting of 40 healthy participants: 24 females (60%) and 16 males (40%). The patients’ mean age was 38.03±16.29 years. Baseline clinical and laboratory characteristics of the participants are given in Table 1. No participant had evidence of atherosclerosis, diabetes mellitus hypertension, hypercholesterolemia, arterial or venous thrombosis. Raynaud's medication or other drugs which may affect platelet aggregation were stopped at least 2 weeks previously. Blood samples were drawn from the antecubital vein by careful venipuncture using a 21-gauge needle attached to sterile syringe without stasis at 8.00 to 10.00 AM, after a fasting period of 12 hours. The following hematological parameters were recorded in all blood samples: hemoglobin (g/dl), white blood cell (WBC), C-reactive protein (CRP) platelet count (PLT), MPV. Whole-blood cell counting was routinely performed by the following parameters: WBC (109/L), PLT (109/L), and MPV (fl). Mean platelet volume was measured in a blood sample collected in dipotassium EDTA tubes. An automatic blood counter (Cell-Dyn 3700, Abbott Diagnostics, Santa Clara, CA, USA) was used for whole blood counts. Mean platelet volume was measured within 30 minutes after sampling to prevent EDTA-induced platelet swelling. Whole-blood cell counting was routinely performed by the following parameters: PLT (109/L), and MPV (fl). We recorded the age, gender, systolic blood pressure (SBP), diastolic blood pressure (DBP), and smoking status of our patients. Descriptive statistics were presented as means, medians, standard deviations, percentage, frequency distributions, minimum, and maximum values. Mann Whitney U Test or Student’s t-test was used in the analysis of the difference between the groups according to measured values. Categorical data were compared using chi-square test, and Spearman's correlation test was used to determine the relationships between the various parameters. Data were expressed as the mean and standard deviation (M±SD). P-values smaller than 0.05 were accepted significant statistically. Analyses were done by using SPSS 18.00 packet program. The clinical and laboratory findings of the study and control groups were summarized in Table 1. CREST denotes Calcinosis Cutis, Raynaud’s Phenomenon, Esophageal Dysfunction, Sclerodactyly, and Telangiectasia. RP, Raynaud’s Phenomenon; BMI, body mass index; SBP, systolic blood pressure; DBP, diastolic blood pressure; PLT, platelet count; WBC, white blood cell; CRP, C reactive protein. Age (p=0.891), BMI (p=0.677), gender (p=0.899), smoking status (p=0.314), hemoglobin (p=0.585), WBC (p=0.884), CRP (p=0.961), PLT (p=0.741) (Table 2), and MPV (p=0.274, Figure 1) were statistically similar in patients with RP and control group. Positive correlation was found between age (p<0.001), systolic BP (p<0.001) and age of onset and duration of RP. The mean age of onset of secondary RP group and the mean duration of secondary RP were higher than the primary RP group (Table 3). The mean of MPV was significantly higher among patients with secondary RP when compared with patients with primary RP (p=0.018) (Figure 2). Volume of a thrombocyte has a large scale that changes between (2-40 fl), and various factor may influence the volume of a thrombocyte like thrombocytopenia resulting from platelet loss or consumption than in those with thrombocytopenia secondary to failure of the bone marrow . Megakaryocytes are polyploid cells; they have varying concentrations of DNA within the nucleus and they are capable of changing the relative distribution of DNA concentration. Increase in platelet volume has been shown to be associated with increase in the DNA concentration of megakaryocytes [7, 8]. Increased MPV is associated with gestational diabetes mellitus , congestive cardiac failure , hypertension , hypercholesterolemia , smoking , stroke , and peripheral artery disease . In other studies, changes in MPV have been linked to alterations in thrombogenesis, and the level of circulating autoantibodies and inflammatory agents [16, 17]. Kısacık and et al. reported that MPV was significantly lower in both ankylosing spondylitis (AS) patients and RA patients with active disease as compared to controls. Significantly higher baseline MPV was reported as compared to controls decreased by therapy in a study, consisting of 88 AS patients . Raynaud’s Phenomenon is the earliest and most common clinical manifestations of scleroderma (systemic sclerosis). Therefore, RP offers the best window into the investigation of the early steps in the pathogenesis of systemic sclerosis. Progressive deficiency in vasodilatory capacity of the vessels is proposed as a mechanism of RP, particularly in systemic sclerosis. In addition, decreased fibrinolysis and enhanced coagulation pathways undoubtedly contribute to vascular dysfunction . In primary Raynaud and systemic sclerosis, increased platelet activation and aggregation has been reported . In, patients with severe RP, whether or not associated with SSc, were shown to have abnormally increased platelet activity. Hyperactive platelets may further impede blood flow in RP. In our study, we could find no significant change in MPV in patients with RP compared to controls statistically. 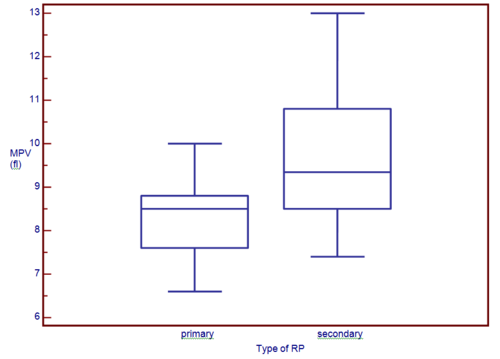 However, MPV was significantly higher among patients with secondary RP when compared with patients with primary RP. The difference in MPV between primary and secondary RP might be explained by the factor that our secondary RP group was consisted of patients with connective tissue diseases including limited scleroderma, systemic sclerosis, and mixed connective tissue disease. The number of patients who were included in the study is a limitation of this study, and prospective studies with larger number of patients are needed to evaluate the role of MPV in RP. Increased platelet activity may be involved in the pathogenesis of secondary RP in comparison with primary RP. We suggest that MPV is a simple, easily obtainable biomarker that might predict a patient's predilection to develop RP and/or require prophylaxis for RP secondary due to CTDs. Deniz Özel – Statistician, Department of Biostatistics and Medical Informatics, Akdeniz University, School of Medicine, Antalya, Turkey. © 2013, Memetoğlu M.E., Kutlu R., Memetoğlu O.G., Kehlibar T., Yılmaz M., Günay R., Ketenci B., Güney M.R., Demirtaş M.M., Özel D.